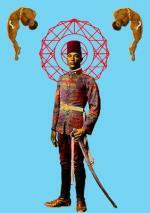 The history of the African Art Gallery of Milan goes back a long way. It was founded in the Sixties by Adolfo Bartolomucci who had then left France to teach at a technical college in Bamako (Mali), only to discover that a sedentary life was not for him. In order to indulge his travel lust and ardent interest in the brousse (the French Colonial term for wilderness) where intriguing objects then known as “primitive art” were still crafted by little-known ethnic groups living in remote villages, he decided to set up as an importer of Italian agricultural equipment and also began organizing tourist excursions to the famous Bandiagara cliff-dwellings of the Dogon. Through systematic exploration and research pursued during his leisure hours, he learned more and more about the lore of populations such as the Dogon, Bambara, Lobi, Bobo and Senufo whose cultures he had first encountered in the pages of scholarly French publications. 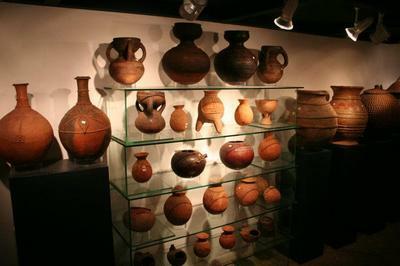 When archeological finds began to surface, between 1965 and 1975, in territories where the Djenné, Bura-Asinda and Komaland cultures were known to have flourished, being on the scene afforded Bartolomucci a unique opportunity to visit the sites where digging was being conducted (in a frequently haphazard and unscientific manner), and gather first-hand information of vital importance to our understanding of these cultures. 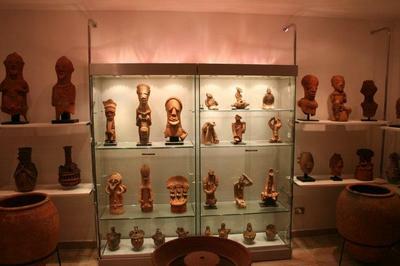 “African Art” (as the gallery was originally known) began doing business with museums and galleries in Europe and the U.S. between 1967 and 1968, supplying them with African sculptures and other artifacts and marketing original Venetian and Murano glass beads (of the “rosetta”, “millefiori” etc. types) as a sideline. 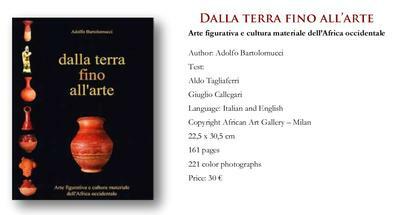 But Bartolomucci is above all a fine connoisseur of earthenware and the admirable specimens he has collected over the years have been proudly displayed at numerous exhibitions and art fairs. From Earth to Art, the latest show mounted by the African Art Gallery, comes with an impressive catalog and crowns 35 years of incessant activity. 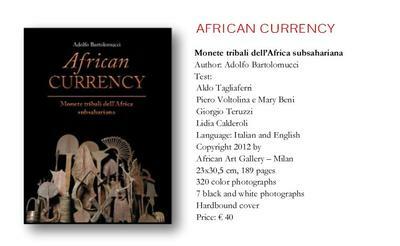 The exhibition, housed in the refurbished and expanded premises of the gallery in Via Caterina da Forlì 28, Milan, proposes to underscore the importance of the gallery’s contribution to the appreciation of African arts in Italy. A good number of Italian collectors stand beholden to the gallery for the collections they were able to gather in these past decades, enjoying the director’s unfailing willingness to share discoveries made in some 50 years of travel deep in the heart of Africa, from Senegal to the Congo, hunting for fascinating specimens and authentic masterpieces. The objects on sale at the gallery include wood carvings (statues, masks, utensils), earthenware, bronze sculptures, ethnic textiles and an important selection of ethnic currencies coined in iron, bronze and copper. The gallery caters to collectors, museums and other galleries. Sales take place on the premises or via a web site on the internet, following procedures illustrated in the purchases window. The gallery seeks to expand its contacts with its European and North American counterparts and dealers in general by means of web linkages. Proposals submitted will receive prompt and thorough attention.